As a diehard Sylvester Stallone fan it pains me to admit it, but the first Expendables was merely passable. As much as I wanted to love it, I couldn’t shake the feeling that it was a missed opportunity in many ways. 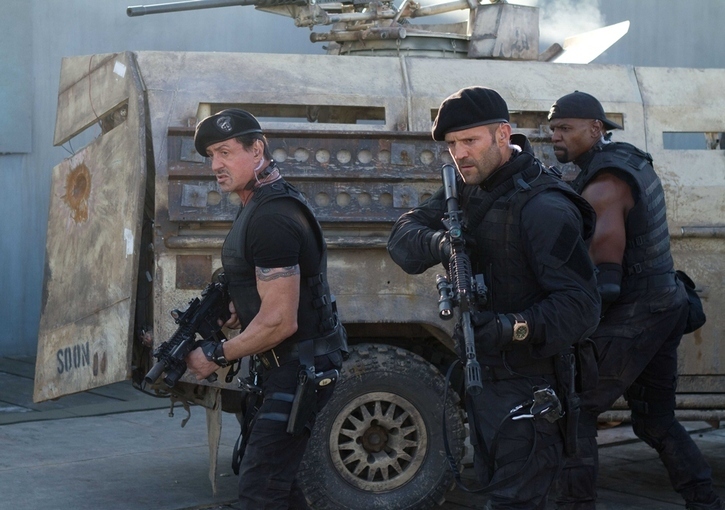 The Expendables 2 manages to improve upon everything lacking in the original. The chemistry amongst the brawny cast is more natural, the jokes are sharper (and more frequent), and the action scenes are more coherently staged. I had a blast seeing it in theaters and I’m happy to say the film held up perfectly as I revisited it on Blu-ray. Maybe the improvement was down to the fact that Stallone didn’t try to do everything himself this time. Don’t get me wrong, as detailed in the phenomenally entertaining Inferno documentary, Stallone’s dedication as writer-director-star while making the first Expendables was truly admirable. But by his own admission, he had bitten off more than he could chew. Bringing in Simon West, a good meat-and-potatoes action director previously best-known for Con Air and Lara Croft: Tomb Raider, was a smart move. Even though it’s the same length as its predecessor, the sequel’s 103 minutes simply move faster. Stallone stayed on as a co-screenwriter (with Richard Wenk), so the film still very much bears his stylistic imprint. The story is more straightforward this time around. After successfully completing the daring rescue of Trench (Arnold Schwarzenegger, in a role beefed up beyond his cameo in part one), Barney Ross (Stallone) is contacted by CIA agent Mr. Church (Bruce Willis, with a similarly expanded role). Church has another mission for Barney and his team, one that just might redeem them after the mess they made in the first film. They’re tasked with recovering a computer containing information about the location of a large quantity of plutonium. Accompanying the Expendables, at Church’s insistence, is Maggie Chan (Yu Nan), an operative of somewhat ill-defined specialties. Of course, there’s a criminal mastermind attempting to obtain this information. Jean Vilain (Jean-Claude Van Damme) leads a team of Satanists whose goal is to locate the plutonium and off-load it for large sums of money. It’s not the brainiest story in the world, nor was it intended to be. As Barney, Lee Christmas (Jason Statham), Gunner Jensen (Dolph Lundgren), Hale Caesar (Terry Crews), Toll Road (Randy Couture), and newcomers Maggie and Billy the Kid (Liam Hemsworth) attempt to complete their mission while fending off Vilain, the action gets increasingly explosive. Van Damme makes the most of his screen time, chewing up the scenery something fierce as Vilain. Of the returning cast, Lundgren is the revelation. The surly, drug-abusing Gunner of the first film has been reformed. He’s now far more light-hearted, with Lundgren getting the biggest laughs. If you’ve noted the absence of Jet Li’s Yin Yang from the above list, that’s because his appearance amounts to little more than a cameo. Apparently due to scheduling conflicts, Li departs the film quite early. It’s unfortunate considering Li was generally underused the first time around as well. Everyone gets at least one spotlight moment. Statham has a killer scene while posing as a priest, unleashing Lee’s knife-wielding skills. It’s good fun seeing Stallone, Schwarzenegger, and Willis actually in action together this time (they shared one brief conversation in the first one). The big disappointment is Chuck Norris, whose cameo as lone-wolf mercenary Booker falls flat. With Norris’ legendary martial arts skills, you’d think a little hand-to-hand combat would’ve been a natural. But all we get during his very limited screen time is some standard-issue gunplay as Booker mows down extras. Luckily there’s little else to complain about. Both Hemsworth and Nan have effective moments, adding youth and feminine components to the team, respectively. Suspense isn’t exactly high as the team tracks Vilain, leading up to the inevitable showdown, but the formulaic plot is really beside the point. The Expendables 2 doesn’t look anywhere near as good in 1080p high definition as one would expect from a $100 million production. I noted during my theatrical screening of the film that Shelly Johnson’s cinematography was a morass of frustrating softness, poor lighting, and an abundance of grain. It looks better on Blu-ray, but it’s still an ugly film. The chunky, frequently-present grain sometimes takes on the appearance of digital noise (for the record, the production was shot on 35mm film). The image is still soft at times. Interiors are generally underlit, resulting in the crushing out of detail (very evident during Stallone and Van Damme’s big fight scene). Thankfully, the 7.1 DTS-HD Master Audio soundtrack exhibits no problems at all. This mix hits all the right spots, delivering an aggressive and immersive audio experience. Based on the great soundtrack of the first film, I wasn’t surprised that this one is on the same level. With the variety of accents on display with the international cast, dialogue clarity is even more important than usual. I picked up on lines I missed during my theatrical screening (like Statham’s “Now that’s what I call Chinese takeout” upon Li’s early departure via parachute). Stallone’s rumbling, bass-heavy voice comes through with great resonance. Brian Tyler’s score is well-balanced throughout, often heard from the rear channels along with highly directional gunfire and other effects. As for supplements, Simon West provides a fairly staid commentary. I love Stallone’s commentaries, so I was hoping that, as writer-star, he would at least be a participant. That’s not the case, and the commentary is lesser for it. But West offers some interesting information. The deleted scenes total about four minutes and are uniformly inessential. At least the gag reel has a few funny bits. “Gods of War” is a decent making-of featurette, though at 20 minutes or so it obviously pales in comparison to the first film’s feature-length Inferno. 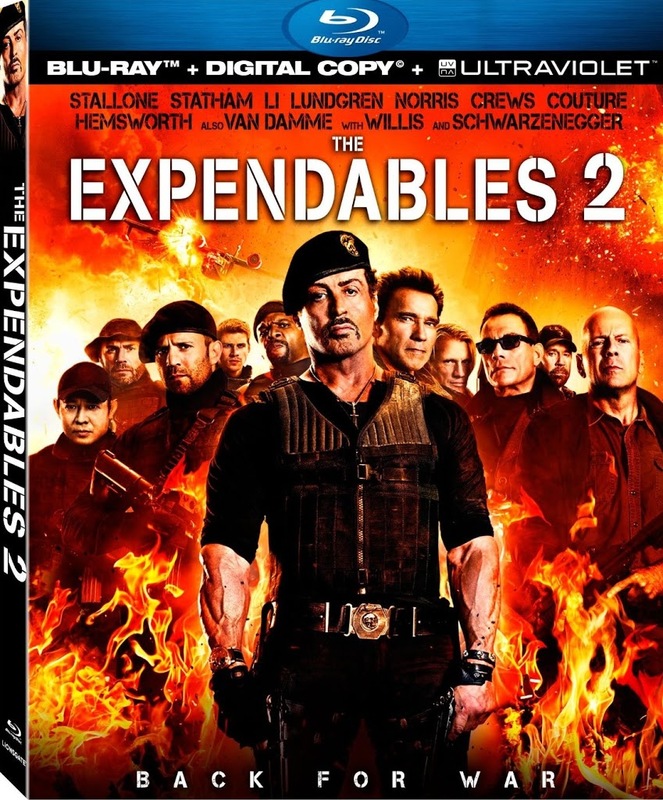 The rest of the featurettes aren’t strictly about The Expendables 2. “Big Guns, Bigger Heroes” focuses on the evolution of the action film throughout the ‘80s. 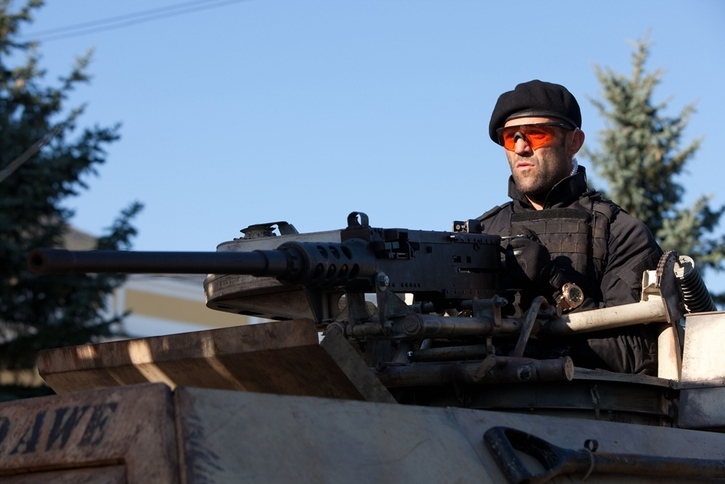 “On the Assault” features Randy Couture demonstrating the real firearms seen the film. “Guns for Hire” is an interesting look at real-life private security firms that hire out mercenaries. 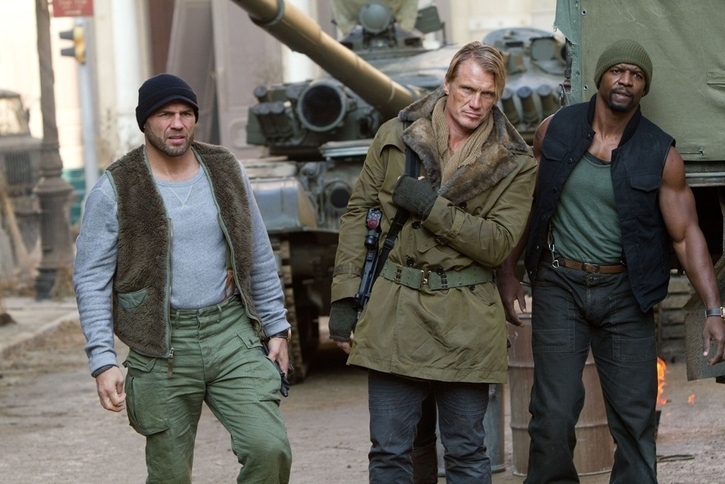 The Expendables 2 is the best kind of big, dumb action movie. It’s hyper-aware of its own implausibilities and sometimes too-convenient plot contrivances. The rampant in-jokes about the aging stars’ past glories (more than one famous catchphrase is repurposed) are spot-on. Stallone, West, and company are only seeking to entertain and in that regard they succeed with flying colors.